Male hormones are involved in causing these changes. 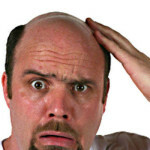 The level of the main male hormone, testosterone, is normal in men with baldness. Hair follicles convert testosterone into another hormone called dihydrotestosterone. For reasons that are not clear, affected hair follicles become more sensitive to dihydrotestosterone, which causes the hair follicles to shrink. It is also not clear why different hair follicles are affected at different times to make the balding process gradual. The condition is hereditary (genetic); the location of the gene was identified in 2008. It is also not clear why only scalp hairs are affected and not other areas such as the beard or armpits.